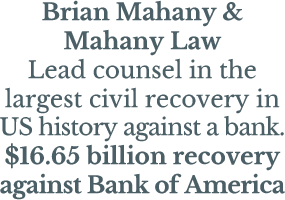 One of the most dynamic areas of lender liability law centers on personal guarantees. Since 2007, lenders often demand more than physical collateral when making large commercial loans. They want guarantees. Worse than the guarantees themselves are the onerous provisions often found in the boilerplate of the actual guaranty document. We often see language that makes guarantees perpetual. These so-called “continuing guarantee” provisions say the borrower is responsible not only for the original loan but any future borrowings. That means a principal who guarantees a $100,000 loan and later leaves the company may find himself being sued for a million dollars assuming the loan was subsequently renewed and the borrowings expanded. Another problem guaranty provision is the clause that waives all the guarantor’s defenses in a subsequent default. Right, it's in the fine print. Yet another problem occurs when loan documents contain an absolute guarantee that allows the bank to pursue the guarantor first rather than pursuing the debtor and any collateral as a prerequisite. Some supposed non-recourse loans have springing guarantees (often called "bad-boy" provisions.) These allow the lender to pursue individual debtors if certain loan covenants are breached. As an example, a common bad boy carve out occurs when a debtor pays a dividend or makes a distribution after being in default. Often the guarantors don’t have any notice of the default and don’t even know there is a personal guarantee until they are served with lawsuit papers. Borrowers often don’t learn of these provisions until a loan is in default. The best defense, therefore, is to have a competent lawyer review all the loan documents prior to signing. It is easier to avoid problems by negotiating around problem personal guaranty terms before the documents are signed. That said, there are limits on what banks can do to guarantors in the event of a default. Personal guarantees can be voided if they are based on fraud or undue influence. Some courts and legislatures have also stepped in to prevent operation of onerous bad boy springing guarantees. Key to all litigation over the efficacy of personal guarantees is the bank’s duty to disclose and its duty of fair dealing and good faith. In many cases, there are also issues pertaining to potential waiver of these defenses by the guarantor. Recently more courts and states are limiting the ability of lenders to pursue guarantors for deficiency judgments, which result when the loan collateral is insufficient to cover the amount owed. Borrowers and guarantors who are being sued by lenders shouldn’t give up hope. 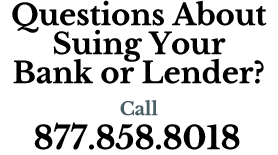 Notwithstanding the often onerous nature of loan documents, borrowers can win when sued by banks.